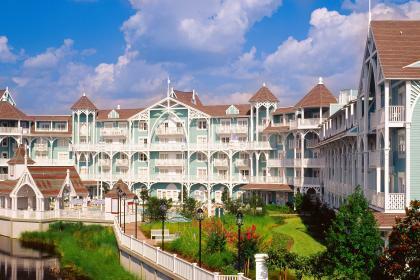 tep into New England Style elegance at Disney’s Beach Club Villa Resort. Located just a short walk from Epcot entrance at International Gateway, or take the Friendship water taxi to Disney’s Hollywood Studios. 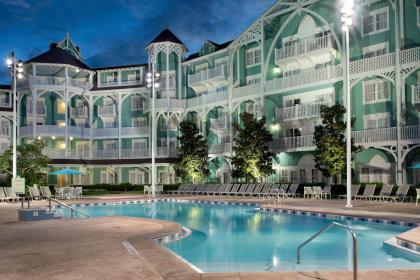 These deluxe accommodations share all the wonderful amenities of the Yacht & Beach Club resorts including the unique 3-acre water recreation area of Stormalong Bay complete with a waterslide, lazy river, 2 kiddie pools and 3 whirlpool spas. 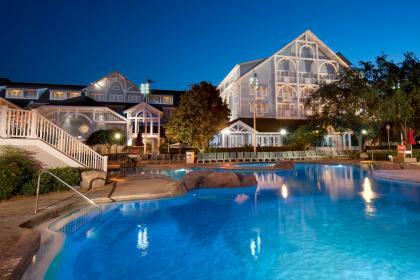 Guests will be spoilt for choice at the dining locations offered here, including the famous “Kitchen Sink” as well as other popular ice cream sundaes and American grill favourites served at the old fashioned soda fountain Beaches & Cream, character breakfasts at Cape May café to fine dining at the highly acclaimed Yachtsman Steakhouse. Deluxe Studios can sleep up to 5 adults, and are equipped with kitchenette, and a small balcony/porch. 1 bedroom villas sleep up to 4 adults with the 2 bedroom villas sleeping up to 8 adults. These villas provide spacious family living accommodations, which include living room/kitchen balcony or porch and even in room laundry facilities. Everything to make this a truly comfortable home away from home.